5.5 miles on the big block, 50*, 4 mph wind, a rather nice morning at 6:45am. 4 days 15 hours till showtime at SGM. Yea, Taper Time is almost complete and race Day is almost here! 2.62 shake down miles @6:45am. That's it for training, it's all done but the St George Marathon on Saturday Oct 6. Taper rest and carb load! Rest, travel, and carb load day! The 42nd annual Running of the St George Marathon, at St George Utah, and my 14th St Geo Marathon and my 59th Marathon overall. It was a cold rainy overcast Marathon day, not the worst, not the best, just a stroll in the cold & rain. Decided early to run the entire marathon w/Troy for moral support. The 10 year club banquet was great and there were so many of my past and present friends in attendance. Now it’s time to get recovered and ready for the University of Utah Homecoming 5k on the 20th of October! Nothing new today, just R & R ! 3 Wobblie recovery miles on the short block. rest, relax and recover day....except for some yard work that needed my attention. 3.2 mi run on the "ele"
It was a perfect morning for a great 5k. I only wish I wasn’t still so tired from the St Geo Mary two weeks ago. I was about 7 minutes slower than last year, but I still managed to be first in my age group (65-69) of 7 old educated men! I bumped into sweet Ms. RAD and her son Adam (fartlek). Adam is an amazing 8 year old runner and he beat this old man to the finish line this day, attaboy Adam! Adam wasn’t the only body to beat the old Tom Slick to the finish line, Troy my good friend who I trained up for his first two marathons beat me to the finish line for his first time ever! Another well earned attaboy to Troy. 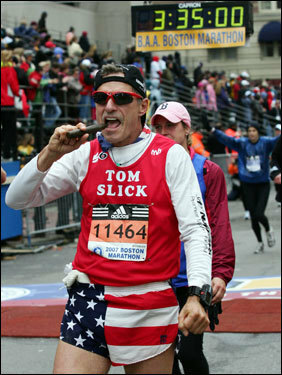 Life goes on, Now my thoughts and actions turn to returning to Boston 2019 for my 60th Marathon!